Well, following on from my post of last week, it seems that in America the presidential election race is now done and all over bar the shouting, and it seems to me from what I’ve heard on radio and television here on the north coast of Eastern Australia that there is a whole lot of shouting going on. But for all this, I suppose that what it comes down to in the end, is, the people of the USA as well as world trade, world economics, and every other thing these presidential matters affect, now have to be prepared for change. The powers that be are trying to bring about a smooth transition from the outgoing Obama administration to the incoming Trump administration, and who knows, the transition may well be smooth. But whichever way you look at it, what the general outcome of the new US Presidency will be remains to be seen as time goes by and the scene unfolds, and history is writ. As I see it, with what is going on at the present time with the various countries all over the globe, world history is at one of those stand-still, melting pot points where the whole world is in a shake-up process of redefining itself. Scary!!! I wonder where the world will be at, in, say, 50 years down the track from now? In my last post I also noted that according to the Worldometers on the net, as of January 2016 the population of the United States of America (USA) was estimated to be 323 025 335 people, and the population of Australia was estimated to be 24 168 303 people. In regards to where the population figures will be in Australia and America respectively in, say, 50 years from now is a little beyond my maths, but I imagine that if the population figures in both countries keep climbing the way they have been over the last few years, and the area measurement in both countries is exactly the same it is deemed to be now, the peoples living then might all be in terrible trouble. Australia is the planet’s sixth largest country after Russia, Canada, China, the USA, and Brazil. At 7 692 024 km2, it accounts for just five percent of the world’s land area of 149 450 000 km2, and although it is the smallest continental land mass, it is the world’s largest island. Calculations on Australia’s area are based on the coastline data as explained in Geoscience Australia’s GEODATA Coast 100K 2004 page. The coastline data is nationally uniform, is sourced primarily from the 1:100 000 scale National Topographic Map Series and is the most authoritative data source currently available to calculate the area of Australia. 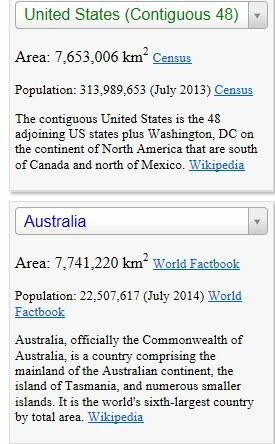 Australia is 1.2% larger than United States (Contiguous 48).